Pre-K - Lower Elementary. 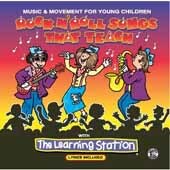 Jamming with action, participation and fun, these exciting movement songs will motivate kids to dance, play and learn new skills. There are circle games, nursery rhymes and activities, all set to a rock and roll beat. A "cheecha, chaacha" zany version of Singing In the Rain is everyone's favorite.